As 21st century medical education continues to transform into an interactive, learner-centered framework, technology has emerged as a valuable resource to aid in this transformation. The Fall 2018 IAMSE Webinar series explores the role of multiple technologies in supporting and guiding the evolution of 21st century medical education. Recent advances in Virtual Reality and Augmented Reality technology now allow for the creation of realistic, highly immersive experiences for gaming, entertainment, and education at a fraction of the cost of earlier systems. In the past 24 months there has been a dramatic increase in hardware, software, and peripheral devices available for VR and AR experiences. The investment by Facebook of approximately $3 billion in Oculus to develop that platform is but one example of the race to develop VR systems for a wide variety of applications. The HTC Vive and Oculus Rift provide fully immersive desktop-class VR systems with controllers and peripherals that allow for individual tracking, multiplayer participation, and highly immersive simulations. As such, VR simulations which were previously restricted to very expensive systems in large simulation centers can now be created at significantly less cost and be accessible by a wider variety of organizations from K-12 classrooms, universities and medical schools. This presentation will review the emerging field of Virtual Reality and Augmented Reality in medical education and discuss the opportunities and challenges involved in realizing the potential of these technologies. Discuss the opportunities and challenges involved in realizing the potential of these technologies. Douglas Danforth is an Associate Professor in the Department of Obstetrics and Gynecology at The Ohio State University College of Medicine. 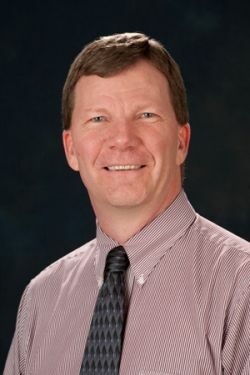 He has been involved in medical education for over 20 years at Ohio State and has served as Reproduction Block Leader and Program Director for the Independent Study Pathway and currently serves as the Academic Program Director for Part One (Med 1-2) of the undergraduate medical education curriculum. His primary research interests are in medical education using Virtual Patients and Virtual Reality(VR). Our Virtual Patients are controlled by artificial intelligence to enable students to practice their history taking skills using natural conversation, and the system is designed to provide immediate feedback to the students on their interaction. Our research in Virtual Reality is designed to improve patient safety using VRto train and assess emergency personnel responding to a mass casualty incident. These projects are funded by grants from the Department of Health and Human Services Health Resources and Services Administration, The National Science Foundation, The National Board of Medical Examiners, The Institute for Innovative Technologies in Medial Education, and the Agency for Health Care Research and Quality.